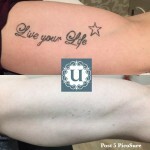 UberSkin offers you PicoSure, the most advanced laser tattoo removal system, renowned for its fast, effective and consistent results. PicoSure is safe. Our system works really well with blues, greens, blacks, greys, turquoise. Our new handpiece now tackles reds, oranges, pink as effectively as the blues and greens. What kind of tattoos do we treat? More Comfortable, No Injury to surrounding tissue and Faster Recovery, because no heat is distributed into the soft tissue unlike older lasers, which only use heat to break up your ink. 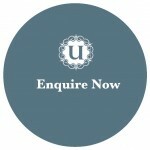 Treatment starts from £65 / session. The cost of treatment is determined by tattoo size, density of ink and detailed patterns within your tattoo. For example – a 10cm tattoo with only an outline, will cost less to remove than a 10cm tattoo with very dense ink & intricate detail. I've already had 15 sessions with a Q-switched laser, will PicoSure work? Does PicoSure tattoo removal feel different to Q-switch lasers?? It’s rare that a tattoo is completely removed after one session. Amateur tattoos could take 4-5 sessions to remove. 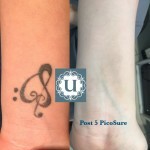 Professional tattoos could take up to 8 sessions with PicoSure. What will my skin look like after my tattoo removal treatment? Your skin will have a frosty look after the laser went over your tattoo. You will see fading over the following weeks. How will my skin heal? 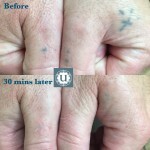 Most patient’s skin look normal, 24 hours after their tattoo removal treatment. Our body is programmed to self-heal. If you have a blister – it will appear within 24-30 hours of your treatment, IF you do get one, it will dry out and slough off and your skin will return to normal within 2 weeks. Do I need to use an antiseptic cream or ointment after my treatment? You don’t need antiseptic cream or ointment as your skin stays in tact with PicoSure. We provide full after care instructions on how to look after your skin to aid the best possible healing. 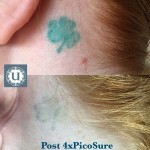 Can Picosure be used on all skin types for tattoo removal? 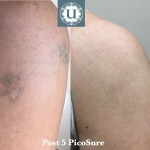 Picosure is not suitable tattoo removal for skin types V & VI, which represents dark brown & black skin types. How soon can I have my next session? We recommend a minimum of 6-8 weeks in between treatments to get the full benefit of each treatment session. The longer you leave in between sessions, the more time your body has to remove the broken down ink and the more fading you will have. Can I only have a part of my tattoo removed or faded for a cover up? Absolutely!! We only remove the ink you want us to remove. Its your choice. What is a ghost image? A ghost image appears as a shadow or ghost image of your tattoo after your treatment has been completed or where ink has been removed. The ghost image does not contain ink. The ghost image will disappear on its own over a period of 6-24 months, without additional treatment. What about semi-permanent make up?